Socio-Economic Correlates Of Shisha Or Waterpipe Smoking In Misurata, Libya. S Sugathan, O Daghir, M Swaysi. Socio-Economic Correlates Of Shisha Or Waterpipe Smoking In Misurata, Libya.. The Internet Journal of Epidemiology. 2010 Volume 9 Number 2. Background: Hookah or Shisha smoking is a major public health problem in Arab countries, especially in the Eastern Mediterranean region. Aim: To study the effect of socioeconomic factors on Hookah or Shisha smoking in Misurata, Libya. Method: Data was collected from 242 regular Hookah smokers in Misurata, Libya using a structured questionnaire. Results: The majority of smokers in this study (34.4%) were of the age group 35-44 years. (Mean age 41.2 and Standard deviation 10.92). Almost half of the Hookah users in the study were businessmen (47%). Majority of the Hookah or water-pipe users (68.8%) were of high income group. Those with a lower income started Hookah smoking, at an earlier age (p<.001). Duration of use was significantly higher in the low income group. Most of the Hookah smokers in this study were having high education (75%). Smokers with lower education level, started the Hookah smoking at an earlier age (p<.001) and the duration of Hookah use was higher among primary school education group (p<.001). Conclusion: Lower education and lower income was significantly associated with early initiation and long duration of Hookah usage. Hookah or Shisha smoking is becoming a global public health problem, especially in the Eastern Mediterranean region (1). The global tobacco epidemic may kill 10 million people annually in the next 20-30 years. More than 70% of these deaths is estimated to occur in developing countries. Current research, treatment, and policy efforts focus on cigarettes, while many people in developing regions smoke tobacco using Hookah or Shisha (2). Hookah or Shishas have long been used for smoking tobacco in the Middle East and parts of Africa and Asia. Shisha smoking is often a social activity and two or more people may share the same pipe. Although their usage appeared to be declining by the mid 1980’s, more recently there has been an upturn in their popularity in the eastern Mediterranean region(3). Globally, the highest rates of Shisha smoking occur in the North African, Eastern Mediterranean and South East Asian regions (4). Hookah or Narghile smoke probably contains several of the chemicals thought to be the causal factors of cancer, cardiovascular disease and dependence in cigarette smokers (5). The reports suggest that Shisha smoking has a deleterious effect on health as well as inducing dependence on nicotine similar to that found in cigarette use (6). Shisha use is associated with classic features of tobacco / nicotine dependence, as well as features unique to this tobacco use method (7). Not many studies are published on the relationship between socioeconomic factors and Hookah smoking from Libya. To study the effect of socioeconomic factors on Hookah or Shisha smoking practices in Misurata, Libya. Study Period: From 1 st December 2009 to 30 th April 2010. Study Population: Data were collected from 242 regular Hookah smokers who visited the 14 popular Hookah cafes. These Hookah cafes were selected by systematic random sampling from different parts of Misurata city. Study Variables: The socioeconomic variables such as education level, occupation, and monthly family income were studied. The variables regarding practices such as age of starting Hookah smoking and duration of Hookah use were also collected and studied. Method of Study: Data were collected by interview method, based on a structured questionnaire. Method of Analysis of Data: Data were tabulated using frequency distribution tables and analyzed using proportions and chi square test. A p-value of less than 0.05 was considered as the level of statistical significance. PASW 18.0 software was used for analysis. 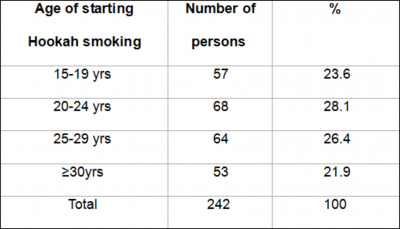 The majority of smokers in this study (34.3%) were of the age group 35-44 years (Table 1). Mean age was 41.2 with a standard deviation of 10.92. About half of the water-pipe users in the study were businessmen (46.3%) followed by skilled labourers (23.6%) (Table 2). Majority of the Hookah smokers (75.2%) were having either secondary school or college education (Table 3). Majority of the Hookah or water-pipe users (68.8%) were of high income group (Table 4). Majority of the Hookah smokers started usage, between 20-24 years. Median age of initiation is 22 years (Table 5). The association between educational status and age of starting Hookah use was found to be highly significant. Majority of those with lower education level started smoking at an earlier age (Table 6). The association between monthly family income and age of starting Hookah use was found to be highly significant. Majority of those with lower income started smoking at an earlier age (Table 7). Majority of the Hookah smokers (37.6%) were smoking for a duration of 10-19 years (Table 8). The association between educational level and the duration of Hookah smoking was found to be highly statistically significant. Duration of Hookah smoking was high in the group with lower education level (Table 9). The association between monthly family income and the duration of Hookah smoking was found to be highly significant. Duration of use was significantly higher in the low income group (Table 10). The majority of smokers in this study (34.4%) were of the age group 35-44 years. Mean age was 42.67 with a standard deviation of 12.150. In a similar study done in Lebanon, the Mean age of Hookah smokers was 35.4 + 15.9 years (6). Most of the Hookah smokers in the current study (47%) were businessmen and majority of Hookah users (69%) were of high income group. In a study done in Karachi, Pakistan, Hookah smoking was more prevalent among the high socioeconomic group (8). This might be because of the affordability among the high income group. In the present study, majority of the Hookah smokers (75%) were having either secondary school or college education. In a study conducted in Lebanon, 82.7% of Shisha users were either intermediate or high education groups (6) which was almost similar to this study. This shows that the knowledge about the harmful effects of Hookah or water-pipe smoking is very less even among those with good education. More health education sessions are required to improve the knowledge and attitude of the public. In the present study, duration of Hookah smoking was significantly high in the group with lower education level. Duration of use was also significantly higher in low income group (p <0.001). In a study done in USA, a significantly increased risk of smoking initiation was observed among people from lower socioeconomic backgrounds. Low socioeconomic status in childhood also increased the risk for progression to regular smoking for prolonged duration (9). A study done in United Arab Emirates, showed that education plays an important role and creates awareness about the hazards of various smoking practices, including Shisha (10). In this research, majority of those with lower income started smoking at an earlier age. Another study done in Ukraine, revealed that men of low income category were more likely to initiate tobacco smoking earlier (11). In the present research, majority of the Hookah smokers started usage, between 20-24 years. Mean age of initiation was 23.69 + 5.828 years. According to a study done in Syria, age of initiation of Hookah smoking was 19.2 + 2.2 years (12). The study in Syria was among university students and our study was among the general public. That might be the reason behind this difference. In the present study, lower education and lower income was significantly associated with early initiation and long duration of Hookah usage. Dr Sandheep Sugathan, Dr Omar M Daghir and Dr Mohammed Swaysi equally contributed in defining and refining the research question, data collection, analysis and writing of manuscript. 1. Rastam S, Ward KD, Eissenberg T, Maziak W. Estimating the beginning of the Shisha epidemic in Syria. BMC Public Health. 2004 Aug 4;4:32. 2. Maziak W, Ward KD, Afifi Soweid RA, Eissenberg T. Tobacco smoking using a Shisha: a re-emerging strain in a global epidemic. Tob Control. 2004 Dec;13(4):327-33. 3. Action on Smoking and Health, Factsheet – 28, Shishas, August 2006 (http://www.ash.org.uk/files/documents/ASH_134.pdf). 4. Shihadeh A et al. Towards a topographical model of narghile water-pipe cafe smoking: a pilot study in a high socioeconomic status neighborhood of Beirut, Lebanon. Pharmacol Biochem Behav. 2004 Sep;79(1):75-82. 5. Shihadeh A, Saleh R. Polycyclic aromatic hydrocarbons, carbon monoxide, “tar”, nicotine in the mainstream smoke aerosol of the narguile water-pipe. Food Chem Toxicol. 2005 May;43(5):655-61..
6. M. Waked, P. Salameh and Z. Aoun. Water-pipe (narguile) smokers in Lebanon: a pilot study. Eastern Mediterranean Health Journal Volume 15 No. 2 March-April, 2009. 7. Maziak W, Eissenberg T, Ward KD. Patterns of Shisha use and dependence: implications for intervention development. Pharmacol Biochem Behav 2005 Jan;80(1):173-9. 8. Anjum Q, Ahmed F, Ashfaq T. Knowledge, attitude and perception of water pipe smoking (Hookah) among adolescents aged 14-19 years. J Pak Med Assoc. 2008 Jun;58(6):312-7. 10. Shaikh RB, Vijayaraghavan N, Sulaiman AS, Kazi S and Shafi MS. The acute effects of Shisha smoking on the cardiovascular and respiratory systems. J Prev Med Hyg. 2008 Sep;49(3):101-7. 12. Maziak W, Fouad FM, Asfar T, et al. Prevalence and characteristics of narghile smoking among university students in Syria. Int J Tuberc Lung Dis. 2004 Jul;8(7):882-9.